Few of us have the money to enjoy a real safari, and so perhaps your best way of accumulating some funds to put towards your own trip of a lifetime is through 50 Lions, a traditional pokie title from the renowned software develop Aristocrat. With 50 paylines available players have plenty of potential for accumulating some nice earnings, while the addition of a Free Spins bonus is another fantastic opportunity to see your kitty increase. 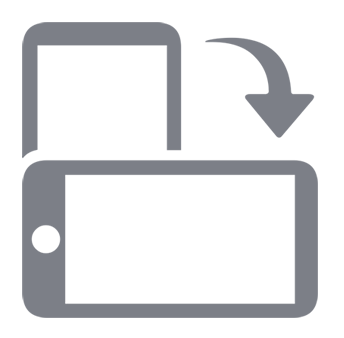 As is usually the case with pokies from Aristocrat and other developers for that matter, the playing card symbols are in place to enable players to pick up some basic wins. The Nine and Ten earn 10 coins, 20 coins and 200 coins for spinning three, four or five for example, with the Jack and Queen earning 10 coins, 30 coins and 200 coins respectively. The top of the tree as far as the playing card symbols are concerned are the King and the Ace, which will reward players with 20 coins for spinning three, 50 coins for four and 400 coins for the full set of five on an active payline. And then we move on to the theme-based symbols, which are generally more lucrative for players than the playing cards. That’s the case with the Sunset and African Tribe icons anyway, which earn players 20 coins, 100 coins and 400 coins for the usual three to five. The penultimate symbols in this particular animal kingdom – let’s call them the jesters to the lion’s king – are the Giraffe and Zebra. These tall chaps will bequeath 4 coins on players simply for spinning a pair on their adjacent reels, 40 coins for a treble, 150 coins for a quadruple and 500 coins for a quintuple (that’s five to me and you). But then, like we say, the king of the animal kingdom is the Lion, and as you might expect from the big fella plenty of rewards are on offer for finding two (10 coins), three (40 coins), four (200 coins) or five (1,000 coins) of this furry firebrand. The fun in 50 Lions doesn’t end there either. This pokie features two additional symbols that players need to keep their eyes peeled for. The scatter, which is the Red Flower, will appear periodically on reels 1, 2 and 3, and this will reward players with four times their stake when three or more appear anywhere on your five reels. Furthermore, this scatter triggers the Free Spins bonus game too (read on for more on that). The wild in 50 Lions is the Diamond. They say it’s a girl’s best friend, but frankly it doesn’t matter what gender you are here; you’ll be hoping that a nice shiny stone to drop onto a payline. That’s because this symbol substitutes for all others (apart from the scatter), and the benefit of this is that extra winning combinations can be created by the wild’s transformative powers. The wild can appear on all of your reels apart from the first (i.e. the far left reel). And now here’s some more about that generous Free Spins feature. Pick up three of the Red Flower scatter symbol and you will truly be in full bloom as ten free spins are handed to you to enjoy. For each spin an extra Wild Diamond is added to reels 2, 3, 4 and 5, which naturally presents some lucrative potential, and even more wonderfully the Free Spins round can be re-triggered by spinning more scatters; although unfortunately only five additional freebies are added to your stash. So that’s 50 Lions summed up rather concisely. Yes, it’s your standard 5-reel pokie format that for some players has become rather old-fashioned nowadays. 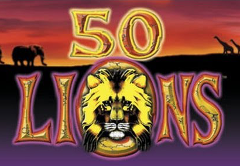 The game lacks the cool animations and graphical elements that have become commonplace in more modern pokie titles, but that’s okay because 50 Lions offers some great prizes and payouts. It does lack a special feature round to elevate it above similar titles, but the Free Spins round is always a welcome addition. Who knows, you might just rack up enough winnings to afford your own safari expedition.